According to some people (our esteemed editor-in-chief) the biggest problem with wine is that eventually you have to go buy more wine because you killed the bottle. For others (like myself) the biggest problem is that you don’t always kill the $30+ bottle of wine in a night. The wine’s flavor changes over the next few days, and then it’s demoted to giving body to your stew. The Kuvee wine bottle is meant for the second kind of person. The two biggest methods of ruining your wine are exposing them to air and light, so the Kuvee bottle keeps both out of your alcoholic grape juice. (temperature can also ruin a good wine—but you’re on your own on that front). It stops the sun by storing the wine in metal bottles and it stops the air by vacuum sealing the wine. No air in or out. 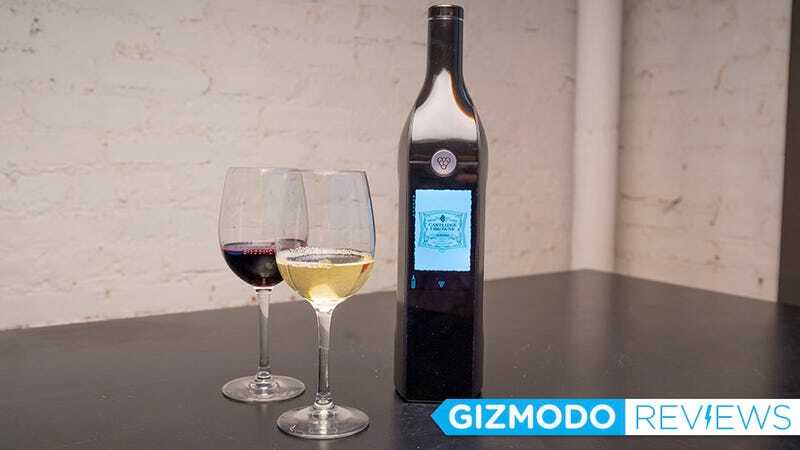 It’s also described as a “smart” wine bottle, but really it’s more of a smart wine bottle sleeve. You slip it over the bottle of wine you’d like to imbibe and it gives you all sorts of important details: how much wine is left, what kind of wine you’re drinking, and what vineyard it’s from—useful if you want to annoy friends with your extreme wine knowledge. The sleeve is wi-fi capable too, so you can connect to the internet to order more bottles. Like the Keurig before it, the Kuvee is all about buying into an ecosystem in order to experience variety. You just pay a little more and get the option of premium products in easy-to-drink serving sizes, and when you’re done you toss away the remnants. Only instead of wasteful little pods, the Kuvee system uses metal bottles that store 750mL of delicious wine. The bottles feature special valves up top to keep the air out, so the wine can only be poured using that big smart wine sleeve. And the bottles are spill proof. You can lose their caps and drop them on the floor all you like. But the downside is that you need the Kuvee wine sleeve to get your drink on. Because the Kuvee system only works with the specific metal bottles, your wine choices are limited to Kuvee’s 48 partners—primarily well known Napa Valley vineyards. The four bottles Kuvee provided me were acceptable. Three of them were $15-$20 wines at my local shop. The fourth bottle, a Kith & Kin Cabernet Sauvignon, would normally retail for closer to $40. Being a Cab gal, I can also say it was the most delicious of the options provided. And it stayed delicious even after a week. Unfortunately my palate isn’t as refined as a sommelier, so I can’t get into the nitty gritty explanations of how the taste barely transformed over seven days. I just know that the wine tasted as smooth on day seven as on day one, and that’s pretty damn impressive. Less impressive in the markup each bottle of wine gets hit with in order to work with the Kuvee system. About $10 a bottle according to my research. * That’s not so bad when you’re dealing with premium bottles of wine and want to be sure none of it is wasted, but I couldn’t see myself blowing $20 on a $10 bottle of wine just so I can drink it whenever I like within the next thirty days. The primary screen. Note the battery bar. If you want to make use of the screen you’ll need to charge your wine bottle. Which brings us to the big problem with the Kuvee system. Who is this for? The website provides three very likely scenarios: the lonely Lucy who can’t finish a bottle of wine in a day, the couple with different tastes in wine who hesitate to open more than one bottle, and the big party where everyone has their own wine preference. In all three situations Kuvee’s ability to maintain a wine’s flavor for up to a month is great. You can open as many bottles as you like and not worry about waste, but they’re still expensive bottles and most wine drinkers (at least in the Gawker Media offices) are cheap. They have no desire to invest $349 in a Kuvee starter pack (or $199 for the current Indiegogo campaign)—even if it includes four bottles of wine. But they all thought it would be a great deal for restaurants. Wine would never go to waste, and you could easily sell by the glass instead of by the pricy bottle. What a deal! So I went to the sommeliers and restauranteurs I know to see if they thought it sounded cool, and they were super excited about the system. “This would be so cool for the at-home wine drinker,” one said, before suggesting the scenario mentioned above. So the winos I spoke with thought it would be great for the restauranteurs and the restauranteurs thought it would be great for the winos. Which kinda makes me think...that as great as the Kuvee is, it’s kinda great for nobody at all. *Editor’s Note: After publishing Kuvee contacted us to say that while price of the wines in stores may very, the Kuvee version will always be the MSRP of a 750 mL bottle.